Requiring a bit of advanced slight of hand, this trick nevertheless is a mind blower when properly done. Get ready to be accused of performing real magic with the Card Transposition! The magician takes a regular deck of playing cards and shows the top card, which he then places in his right trouser pocket. He then shows the next card, which he places face down on a table and asks a spectator to place their hand on top of it. He reaches back into his pocket and produces the first card, and on three both cards are turned face up, to reveal that they have switched places! 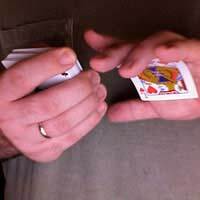 There are two slight of hand moves required for this trick, the double lift and the card palm. A normal deck of playing cards and trousers with loose enough pockets or a jacket with a large enough pocket. Lots of practice is required to get the slights down perfectly- a necessity when performing this or any other complex illusion. The magician produces a deck of regular playing cards and proceeds to explain that they are not, after all, very normal, but rather behave in odd ways. He offers to demonstrate. The magician places the packet of two cards back on top of the deck and then deals off the very top card (not the two of clubs) into his right hand. Keeping the face of the card away from the audience, the magician places the card in his right trouser pocket (or jacket pocket). "Now let’s take a look at the next card in the deck,” the magician says, and performs another double lift. “The Jack of hearts.” The magician replaces the packet of cards on top of the deck and says, “we’ll just put the Jack here on the table” as he deals off the top card (the two of clubs) face down on to the table. The magician asks for the help of a spectator to “keep Jack in line” and put their hand on top of the tabled card. While the spectator is doing so, the magician palms off the top card (the Jack of hearts) with his right hand. Reaching into his pocket with his right hand, the magician says “now we will bring out the two of clubs” and pretends to grab the card he first put in his pocket, but just shifts the grip on the palmed card and pulls it out. Keeping the card in his right hand face down, the magician asks the spectator to turn over his card on the count of three to see if there has been any funny business, and on three both cards are turned over to show that they have switched places. The deck of cards can be now placed in the right trouser or jacket pocket to be retrieved later, along with the initial, indifferent card. The double lift and card palm are key here and must be practiced in front of a mirror to ensure that they are done correctly. The double lift involves riffling the deck of cards with the right thumb and stopping when there are two cards left. Pinching both cards on the bottom, the magician can turn over the packet as one card with practice. Likewise the card palm requires practice- holding the deck of cards in the left hand; place the right over the deck grip just one card. Bend the hand slightly and the card will stay in place. Make sure no card edges are peaking out around your fingers.